Yesterday a great bit of history made it’s way onto the internet, thanks to AJ @Habnad. Kevin Jones’ ground breaking run from the AFA Masters Bristol PA 1989. This was the first time anyone publicly saw the hitchhiker and the backpacker, not to mention as Brett Downs quoted yesterday, “95 percent of his run and his tricks, who else can say that?”. Do yourself a favour, whether your old school, new school whatever labels you chose, watch the crowd reaction when Jones pulls out the backpacker at around 3:58. This is without a doubt one of the influential moments in BMX. Thank you Kevin Jones and thank you AJ for the re-upload in better quality! This is golden! This entry was posted in Contest edits, Must Watch edits!, News, Old school sundays, Throwback Thursdays and tagged AFA Masters Bristol PA 1989, Kevin Jones, Plywood Hoods by Effraim. Bookmark the permalink. I like the skid after the backpacker. Obviously this was pre-internet when the hitchhiker and backpacker were just pure speculation. The crowd reaction to his backpacker ride-out is just amazing! Can’t help but notice Raybo clapping almost every trick,so awesome! I was there! Total game changer! Crazy to think about how quickly flatland dropped off in terms of contest participation. The year before in 1988, there were hundreds of entries at each round of the AFA Masters. The next year, probably less than 100. Greatness. The one and only Kevin Jones. And bang! The beginning of modern day Flatland was born. Effraim, Thanks for the shout out. Appreciated. After digging through some boxes last year, I found this tape, so had to share it out. Although I didn’t personally tape this (a buddies dad did), I was fortunate enough to be the “run music guy” and had a view from the other side. His run was just jaw dropping to watch. If I remember correctly, there was rumor circulating at the contest of Kevin having these tricks to drop, which made the anticipation build up for his run and everyone asking “what is this hitchiker?” When he did pull them, it obviously changed flatland forever. Two footed rolling tricks pretty much started to became the norm, and to the point Rich W. brought up, it could have been one of the driving factors behind riding dropping off (in my opinion, I could be wrong). It just seemed to get too hard too fast. I know I could never find that balance point. Enjoy the video everyone! This run would still hold up at any modern contest. Wow! Awesome to finally get to see his whole run. Thanks for getting it online. What’s really weird is I think the front yard whiplashes are 1000x harder than the hiker or backpacker and I’m not sure what that means. McCoy at the Holeshot UK in 86′ was pretty epic to me but this must have been something else! Kevin Jones is the man – period. @TJ – Forgot to mention the bar hop whiplashes, really impressive for that time! Mindblowing originality, look out for a Jones interview right here in the future. Going to take some time on it! This run was on youtube for about a year and then taken down and reposted to fix technical issues. I personally think kevin had nothing to do with the loss in popularity. Stock market crash in 87, many riders were getting cars, girls and going tocollege. No new generation of flatlanders to replace them. Also a lot of the riders disappeared when the sponsorships ended. Rumor has it that Mccoy was paid by the afa to compete as long as he was guaranteed a victory. Kevin got 2nd place here. Everyone already knew about the hitch. Bill neuman was practicing them all day at the comp and tried it in his run. Wow TJ! There had been whiplash variations out the wazoo throughout 1988. Its a good trick but nowhere near as fresh as the hitch and backpack. Also remember there are more steps to the hitch and backpack, while each indivdual piece of those tricks may be less difficult it becomes harder when you put them all together. I would say the one handed megaspin and the elephant whips were the hardest indivdual tricks he did here. I didn’t mean to suggest in any way Kevin was responsible for the fall off in popularity. Merely pointing out the stark contrast in the contest scene between 88 and 89. In one year, there were hundreds of contest riders. The next year, a few dozen. Guys, dont get me wrong and misunderstood what I said.I didn’t mean to imply Rich said “Kevin was responsible”.I understand what you were saying with the difference of riders at that time. I was just offering my opinion and using his comment on reasons in my mind of why riding could have dropped off as it did. By the time it dropped off as fast as it did, I was already out of it for both the reasons of car/job/girls and I couldn’t keep up with the difficulty. So I really shouldn’t have said what I said using the words I used. And @ David, now that you brought it up, I vaguely remember hearing about Bill N that day doing the trick in practice. Sorry for any confusion caused. kevin showed what you could really do on a bike flatland wise, the same as mat hoffman did on vert. both way ahead in their terms of thinking and putting the vision into a working trick and showing the world what is possible. legends forever. Ground breaking runs like this don’t happen anymore! Still the best rider ever. TJ and Effraim- the bar hop whiplashes we’re called Baykstel whips. Keys word for anything little was Baykstel and he and Dave Mirra made up the trick together, hence the name. Dave was a great baykst. Bill Neumann had heard of the hitch hiker through Chase. He tried it in his run, before Kevin, and couldn’t pull it. Man…to much to say about this clip. Thanks for running it E! I remember when the Tampa crew (Gerry Smith, Tyson Godfrey, & Sean Lesley) brought the video home from the contest weekend. By the time I got to Tyson’s house to ride and see the video, he had handlebar scrapes up and down the ground at his riding spot, and his bar ends sharpened down from trying to learn hitchhickers. 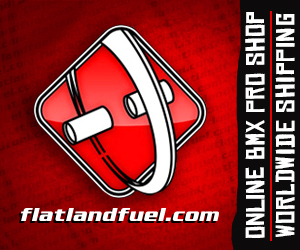 This contest run by far…hands down, is a cornerstone time in flatland history. Like E said….no internet…only rumors. Magazines couldn’t even keep up with the Plywood Hoods rumors. By the time the rumor of the hitchhicker hit Florida, all people could say about it was that Kevin Jones was doing a forward rolling undertaker and riding out of it. Of course….just like all of us who had heard such non-sense reacted with the same response…..”Shut the hell up….that doesn’t even make sense…!”….of course until we all saw the video….and once again…Kevin Jones uped the game….and we all went out and started to try to up ours. I dont really know who this kevin jones guy is but he seems kinda important or something. Nice helmet. At the Austin AFA Master where Kevin did not compete because he was the only pro rider that showed up, Perry Mervar told everybody about the Hitchhiker and everybody was blown away. I heard that he went to Trend Bikes the day after the comp in busted out the Hitchhiker for everybody to see. I think the comp was 1988 I got forth place in my class that year. The Austin Contest was May of 1989. That was where the hitch would have been debuted if the other pro’s would have shown up. I need to dig out my copy of this run too! -I was filming it from the right side (standing with a black TREND shirt). Kevin got 2nd place to Dennis McCoy at this comp and he didn’t care one bit. The AFA judged against flawless runs, and since non of the judges rode flatland, they didn’t really have much respect for the difficulty of the tricks. Dennis definitely did not get paid any kick-back from the AFA. His routines were dialed and he deserved the results. How ridiculous is it that we had to wear those helmets for flatland comps!?? ?